I spent a bunch of time this weekend visiting birding spots in far southeastern Queens, along the coast and adjacent to Nassau County. One of the places I’ve really enjoyed birding and digiscoping at is Bridge Creek, a newly-minted eBird hotspot. 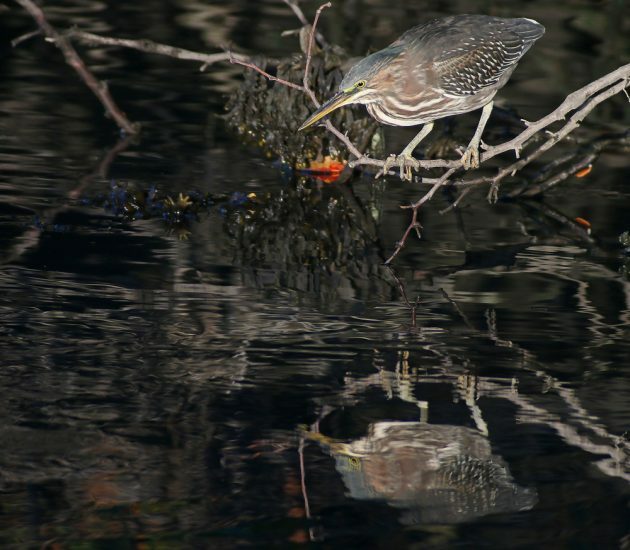 I learned about the location because it is in my turf for the Queens County Christmas Bird Count and is a good location to find wintering Greater Yellowlegs and Belted Kingfishers. A tidal creek, it doesn’t freeze over entirely and the derelict docks offer good loafing locations for shorebirds at high tide. Earlier this summer I convinced the eBird hotspot maven for New York, Ben Cacace, to make Bridge Creek a hotspot and so far I am the only one who has taken advantage of it. Hopefully, this post will spur others to check it out on occasion. The bridge over the creek on Beach 2nd Street is a fun spot to watch herons fishing in the creek and in the early morning the sun is perfectly placed to put good light on them. There is always plenty of parking by the bridge and you don’t have to expend much effort at all to see if anything is around. 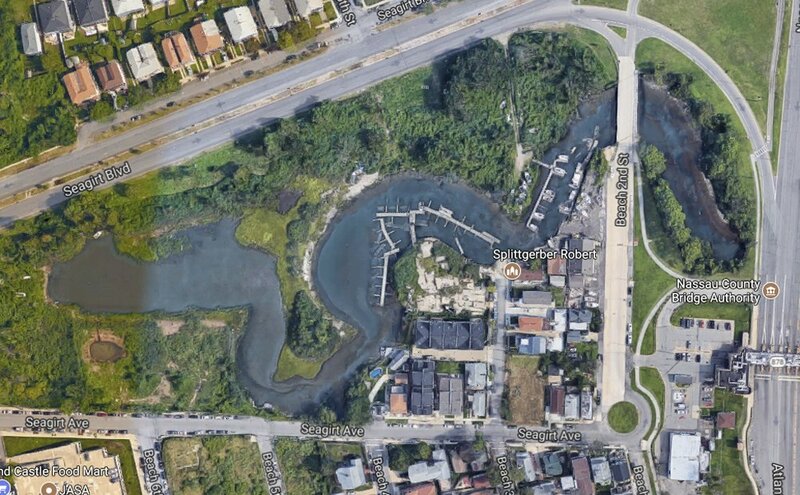 The derelict docks most favored by roosting shorebirds are easily viewed from Seagirt Avenue, where a fire hydrant provides a spot you can pull over for a few minutes to scan the docks. (Otherwise parking on Seagirt is almost impossible.) The views from Seagirt Boulevard are essentially non-existent, so don’t try to get looks at the creek from the north. On Friday morning the tide was on its way down but was still near high when I arrived. 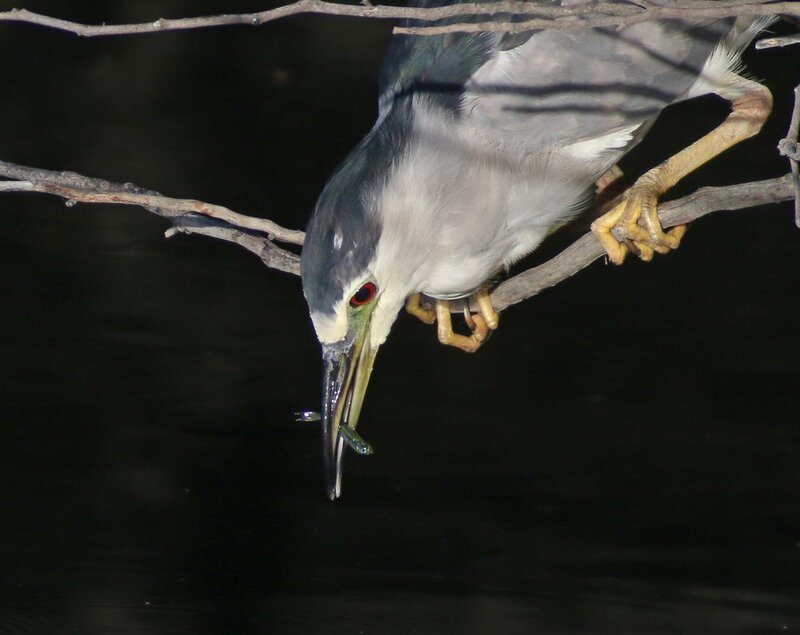 Black-crowned Night-Herons, Yellow-crowned Night-Herons, and a single Green Heron were perched on a variety of dead stubs and branches. One of the black-crowns and the Green Heron were clearly in hunting mode, leaning over the water, staring intently. But why had these herons chosen this particular spot to go fishing? That question was answered rather quickly, as every minute or so I would watch a bunch of silvery bodies break the surface of the creek and splash back into the water. Small fry were being chased to the surface, desperate to escape the death-from-below that were larger fish, completely ignorant of the death that waited above them. Never have I been so glad not to be a fish! 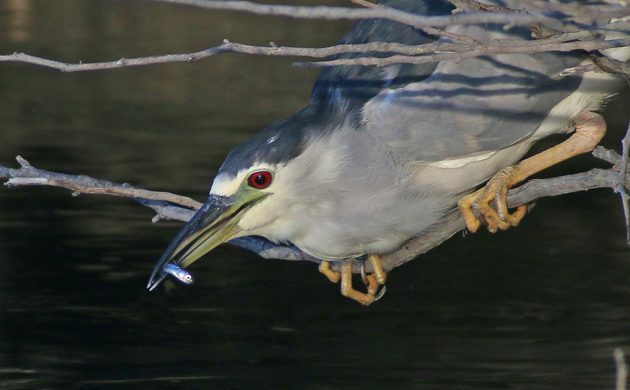 Black-crowned Night-Heron grabbing breakfast as a couple horrified fish look on. 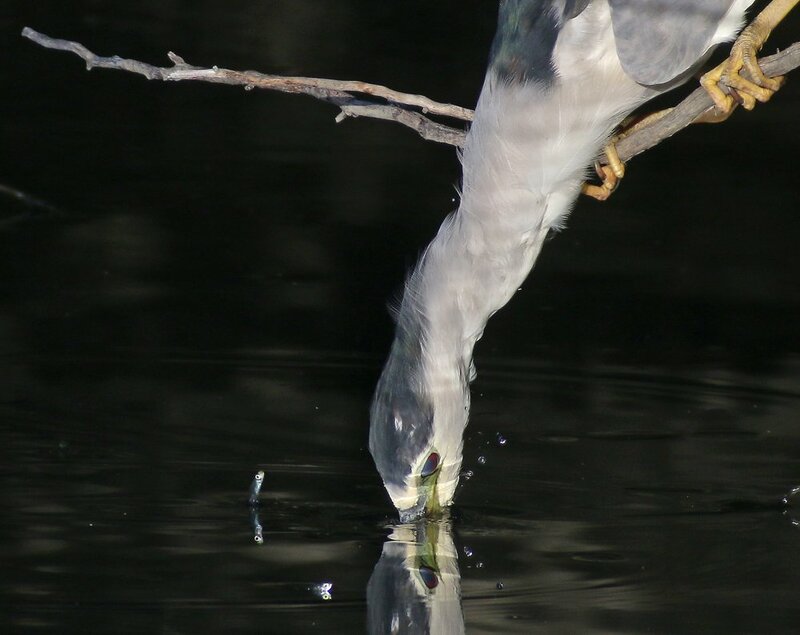 Imagine dodging the maw of a fish only to be gripped by the beak of a heron! I’m used to seeing night-herons sit motionless seemingly forever, striking very infrequently. 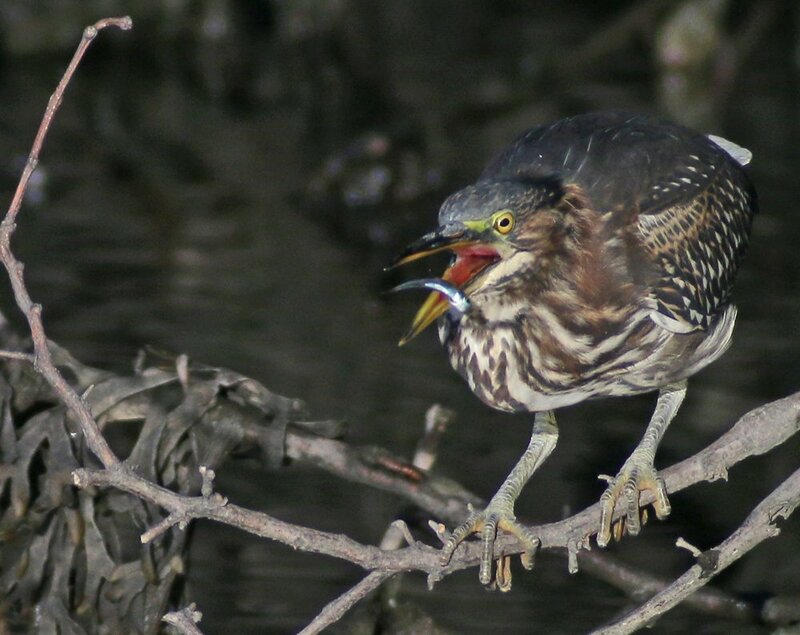 This night-heron was grabbing fish at will, one every couple of minutes. It was fun to watch, much more so for me than for the fish! The Green Heron had the same idea, though it often snatched the fish that cleared the surface entirely, which takes serious beak-eye coordination! 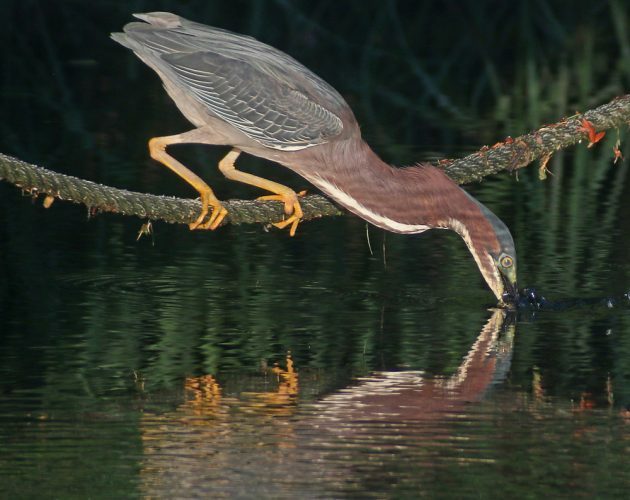 And this isn’t a new behavior at the location: when herons find a food source they don’t forget it. Here’s a Green Heron just a few yards up the creek from back in July, hunting with the same strategy. 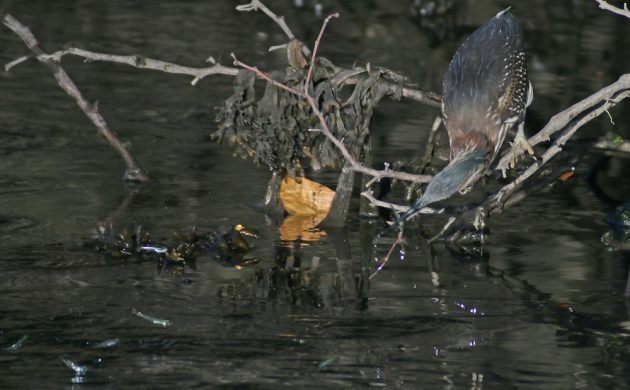 If you’re in New York City and like watching herons you can certainly do worse than Bridge Creek. Get on out there and help me run up the numbers in the eBird hotspot! How About a TV Show About Birding?